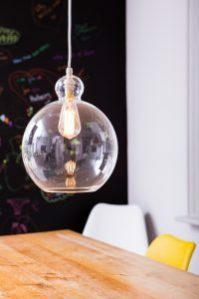 As autumn emerges and the dark nights loom, now is a good time to contemplate your lighting. I have recently put together a few pointers which I thought I would share. 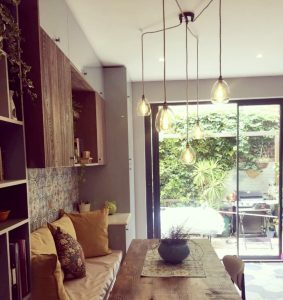 Remember lighting can transform a space, do not be afraid to experiment, use a variety of lighting at different heights and set in different locations. This creates interest and enables you to accentuate areas of the space. 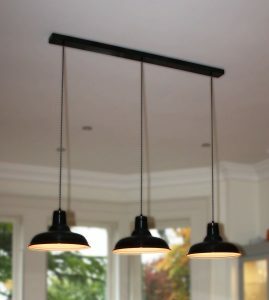 Below is a photo of our William pendant in a kitchen hung at various heights. 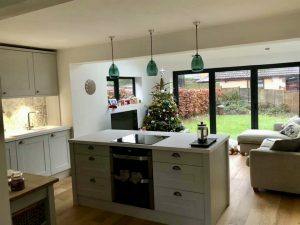 Use dimmers to create more usable light which can be set at full and used for reading or cooking and then dimmed down to produce a more relaxed ambience. Carefully select your light bulbs, colour temperatures of light bulbs are measured on the kelvin temperature scale, the higher the kelvin the cooler the light and the lower the kelvin the warmer orangey glow. Using a warm colour temperature of 2700 Kelvin – 3000 kelvin in living areas, and 3500 kelvin plus for task lighting, such as in the kitchen. 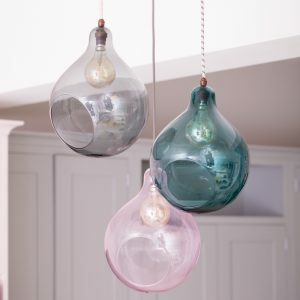 Vintage lightbulbs look quirky and warm and are now available in many LED versions, which have a much longer lifespan. 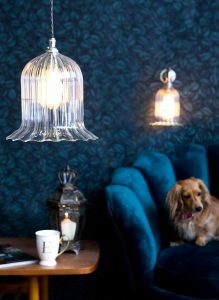 Using shades made of ribbed or opal glass or parchment diffuses light allowing it out sideways giving a better spread of light. Using coloured interiors of shades such as gold, soften the light and give a warm glow. 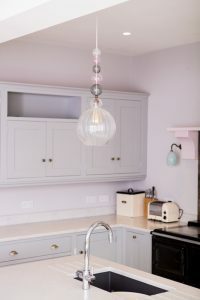 If on a budget replace shades with vintage finds or brighten up pendants by replacing plain cables with coloured or patterned fabric cables. 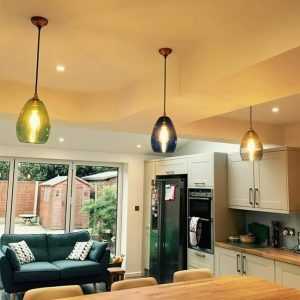 Approximately 5% of household energy costs are used on lighting therefore selecting energy efficient light bulbs can make a big difference. Although the initial outlay may be higher for LED, a 4w LED lightbulb should last around 25 times longer than their 60w incandescent counterparts. 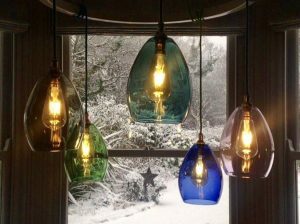 Quirky vintage style LED filament lightbulbs are becoming readily available. 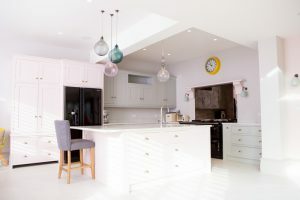 When comparing or replacing LED light bulbs with old style halogen or incandescent lightbulbs look at the lumen output rather than the wattage as this is a much better way of comparing the light output. Photo 1: Humphrey large pendant and wall light, picture with Elsa 😉 Photo 2: William pendants Photo 3: Lovely coloured Bertie bespoke wheel, created for a client.